In today’s tutorial you’ll learn how to level concrete floor spaces, specifically for basement bathrooms. What are the steps? What tools make this easier? 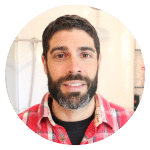 We’ll deep dive into details and share our latest project, which involves building a basement bathroom. Most basement floors are sloped toward a drain. This creates major problems for basement bathroom remodels. Step one is to lay a 2×4 along the floor and determine low and high spots. Next, add concrete screws as height indicators. Use a hammer drill and masonry bit to drill through the concrete floor. Then install concrete screws at the correct height to indicate how much self leveler to use. Learning how to level concrete floor areas, the right way, is important. But unfortunately there are two additional steps that some people forget. Laticrete’s NXT self leveler is great for basements. The first step is to accurately measure how much water is needed. This is critical because if there’s too much or too little water NXT won’t perform – and that goes for all self levelers. Wear a silica dust respirator and pour water into a large mixing barrel, then add NXT. Mix per Laticrete’s directions then immediately pour NXT over prepped and primed concrete floors. Six bags of NXT were required for this basement bathroom, and a floor squeegee was used to spread it evenly. Add enough NXT to cover the floor screw indicators. Wait 24 hours or until the leveler has cured then it’s okay to set a bathtub or tile the floor. 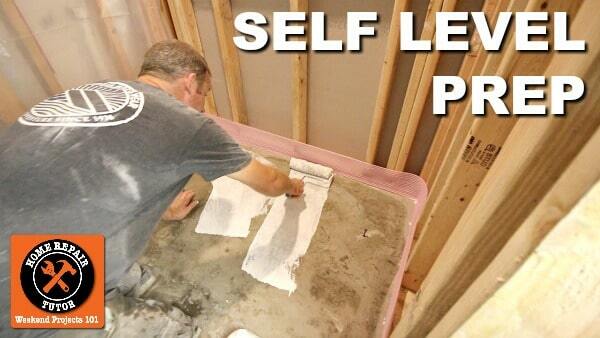 Our next video will share tips for installing a bathtub in a basement bathroom. This bathroom is part of an online course we’re making, called How to Build Basement Tub shower Combos. P.S. Many thanks to our awesome Laticrete rep, Gary Jones, for helping us with this basement bathroom. Gary is fantastic, answered questions on Saturdays, and provided detailed technical support. He made us believers in Laticrete and their products. How would you adapt this process to use self leveling concrete on a wood sub floor? I would like to lay 12″x24″ floor tiles in an upstairs bathroom. What is the level floor tolerance value needed to ensure they wont crack? FYI, thanks to some of your previous videos, I know that I will need to use a decoupling mat. Hey Tracey, the biggest tip for decoupling mats like Ditra or Strata_Mat is to know what the manufacturer requires for the subfloor thickness and joist spacing. Once that’s determined then you can plan the self leveling. I’ll reach out to you and get more details.